Great News!! Have you always wanted your own drive-in movie theater in your backyard or for your large event? Now you can! 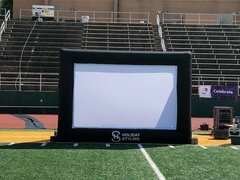 We not only offer projectors, and PA Systems but we also have large inflatable projector screens! Rent the entire package or rent them separetly.